A Bone marrow Transplant / Stem Cell Transplant is a procedure to replace damaged or destroyed Bone marrow with a healthy bone marrow stem cells. Free Medical Opinion from Best Doctors in India upon receipt of Medical reports within 24 hours. Most Affordable Treatment Packages from World-Class Centres for your QualityTreatment. Please Share all your Medical Reports with us, You can send them to us by an email at care (at)ghnservices.com or you may choose to WhatsApp us Clear Pictures of Medical reports on Our Bone Marrow Transplant Helpline +91-9818857545. are produced in bone marrow of a human body. Multiple myeloma is a type of cancer formed by malignant plasma cells. The Normal plasma cells are found in the bone marrow &they are an important part of the immune system.The immune system is made up of several types of cells that work together to fight infections & other diseases in human body. Lymphocytes (The lymph cells) are the main cell type of the immune system. Lymphoma is type of cancer that begins in infection fighting cells of immune system called Lymphocytes. These cells are in the lymph nodes, thymus , spleen and bone marrow of a human being. When a Patient has lymphoma, The lymphocytes change grow out of control. Sickle cell disease is the most common inherited blood disorder. This disease gets its name because when a patient have SCD, your red blood cells look like a SICKLE, which is a C-shaped farm tool. The RBC contains a molecule called hemoglobin, which carries oxygen throughout the human body. In a healthy individual, hemoglobin is flexible, round & smooth. That allows RBC to glide easily through blood stream. But if someone has Sickle cell disease, it develops rods that clump together which causes RBC to become inflexible & curved. The odd shaped cells block the blood flow. Thalassemia is genetic blood disorder. Individuals who are having Thalassemia disease are unable to produce enough haemoglobin which causes severe anemia. When there is lack of hemoglobin in the RBC , oxygen do not get to all the parts of the human body. Different Organs starve for oxygen and as a result they do not function properly. Beta Thalassemia disease, also called Cooley’s Anemia. We provide the Best Bone Marrow Transplant treatment in India / We have the Best Hospitals for bone marrow transplant in India / Best Paediatric Bone Marrow Transplant Hospital in India / Low cost Sickle Cell Disease treatment in India / Best Doctor forStem Cell Transplant in India / Quality Treatment for Lymphoma & Myeloma in India / Best Doctor for bone marrow transplant in India / Best Sickle Cell Disease treatment in India / Best Thalassemia disease Treatment / Best Pediatric Hematologist for Thalassemia disease / Best Multiple Myeloma treatment Hospital / Best hospital for Sickle Cell Disease treatment in India / Low Cost Bone Marrow Transplant for Lymphoma / Best Pediatric Hematologist for Sickle Cell disease/ Best hospital for Thalassemia disease treatment in India / Bone Marrow Transplant for Aplastic Anemia Disease / Most Affordable Bone Marrow Transplant in India / Best Pediatric Hematologist in India / Best hospital for Bone marrow transplant of Children / Best Sickle cell disease treatment of Children / Thalassemia disease treatment of Children in India / Best doctor for Multiple Myeloma Treatment in india / Best Leukemia treatment Hospital in India / Low Cost Bone Marrow Transplant for Leukemia / Affordable Leukemia treatment in India / Affordable Sickle Cell disease Treatment in India / Low Cost Thalassemia Treatment in India / Best Specialists for Sickle Cell disease / Best Thalassemia disease Specialists in India / Best Child Specialist for Bone Marrow Transplant in India / Best Child Specialist for Sickle Cell Disease treatment in India / Best Child Specialist Hospital for Bone Marrow Transplant, Low Cost Bone Marrow Transplant for a Child in India / Child Bone Marrow Transplant in India / Best Hematologist in India / Best Bone Marrow Transplant specialist in India / Best Hospital for Infant Bone Marrow Transplant / Low Cost Infant bone marrow transplant in India / Best doctor for infant bone marrow transplant / Best infant bone marrow transplant specialist in India/ Best Specialist for Leukemia Treatment in India / Bone marrow Transplant for Infants in India / Cost of Stem Cell Transplant for Sickle Cell Disease in India. GHN is providing Quality &Affordable Bone Marrow Transplant to Adult and Paediatric Patients travelling from all corners of the globe. 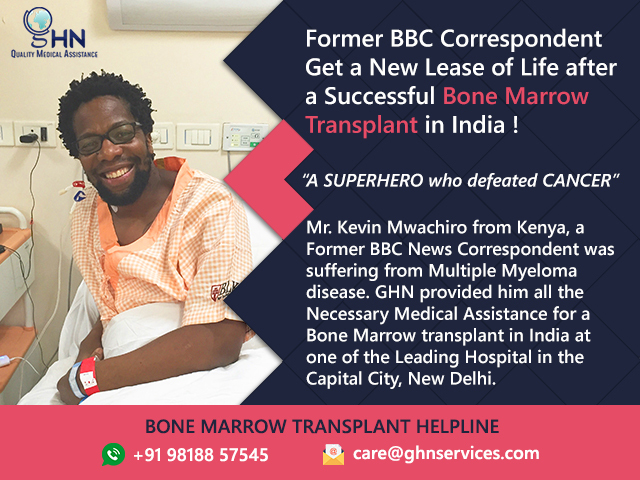 We have assisted large number of Patients for Bone Marrow Transplant in India, these Patients were treated successfully at Our Network Hospitals Like BLK Super Specialty, Fortis, Artemis, Jaypee, Medanta, Gleneagles Global Hospitals & Continental Hospitals etc. under the supervision of finest Haematologist/ Bone Marrow TransplantExperts. For you, It is Important to know that Bone Marrow Transplant is a Complex Treatment, involving a number of phases which a patient needs to go through. The Patients undergoing treatment for Stem Cell Transplantation need specialized medical Services with Strict Supervision by Highly Experienced Doctors, Exclusively Trained Nurses and Paramedical Staffs managing Patients at Bone Marrow Transplant units. Indian Doctors are well known for their excellent work in the field of Stem cell Transplants with a very high rate of Success. GHN is dedicated in Serving Patients from all over Africa, Middle East, SAARC Countries and CIS etc. Travelling to India for Bone Marrow Transplant Treatment. We are able to deliver Excellent results as we are associated with the Team of Best Bone Marrow Transplant Doctors in India working with our Top Partner Hospitals in India.